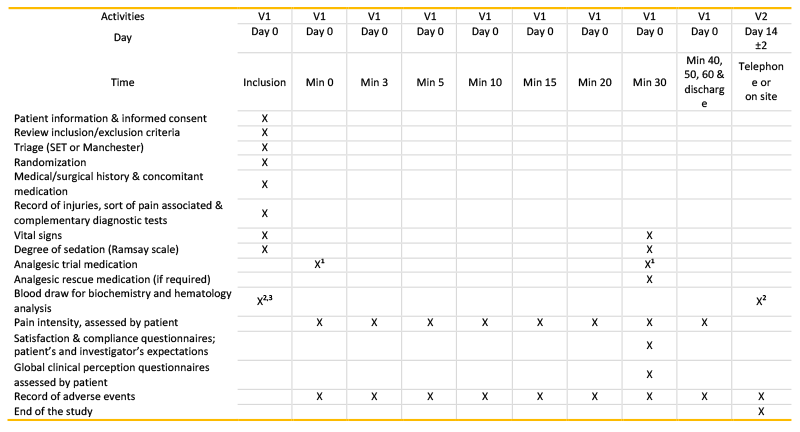 Phase IIIb, open label randomised clinical trial to compare pain relief between methoxyflurane and standard of care for treating patients with trauma pain in Spanish Emergency Units (InMEDIATE): Study protocol. Autores: Alberto M Borobia1,2,3*; Rosa Capilla Pueyo3,4; José Ramón Casal Codesido3,5; Anselma Fernández Testa3,6; José Carlos Martínez Ávila1; Teresa García Morales2,7; Susana Traseira Lugilde8; Antonio J. Carcas1,2; InMEDIATE Group. 5Emergency Department, El Bierzo Hospital, León. The Scientific Committee of the study is made up of members of SEMES and SCReN. Mundipharma Pharmaceuticals S.L funds the study according to the guidelines of the current protocol. Mundipharma Pharmaceuticals S.L agrees not to interfere in the selection processes of the patients, analysis of the data and/or publication of the results, or any other process that might come into play with the results of the study. Funding will be independent of the results of the study. The Spanish Clinical Research Network (SCReN), PT12/0002, is funded by the PE of I+D+I 2013-2016 and by the Subdirección General de Evaluación y Fomento de la Investigación – Instituto de Salud Carlos III (ISCIII). It is also co-financed with funding from FEDER.® PENTHROX is a registered trade mark of Medical Developments International Limited. Alberto M. Borobia Pérez y Antonio J. Carcas Sansuán son editores de la revista, Susana Traseira Lugilde es Directora del Departamento Médico de Mundipharma Pharmaceuticals, el resto de los autores declara que no existen conflictos de interés. Primera publicación 7 de septiembre de 2017. Citar como: Borobia Pérez AM., Capilla Pueyo R., Casal Codesido JR., Fernández Testa A., Martínez Ávila JC., García Morales T., Traseira Lugilde S., Carcas Sansuán AJ. ; InMEDIATE Group. Phase IIIb, open label randomised clinical trial to compare pain relief between methoxyflurane and standard of care for treating patients with trauma pain in Spanish Emergency Units (InMEDIATE): Study protocol. IBJ Clin Pharmacol 2017 1(1):e0008. OBJECTIVE: To evaluate efficacy, safety, patient and investigators satisfaction, and cost of pain relief by time unit between methoxyflurane (a volatile anesthetic agent with known analgesic properties, non-opioid, self-administered using a hand-held inhalation device under trained supervision) and emergency analgesic standard of care treatment (SoC), over a period of 30 min from start of administration and time to first pain relief. METHODS: InMEDIATE is a phase IIIb, randomized, open label, multicenter, parallel group trial. It will be conducted in 15 emergency hospital departments. A total of 310 patients, with moderate to severe pain secondary to trauma, will be randomized to receive either methoxyflurane or SoC. The primary end point of the study is the change in mean pain intensity as measured by a numeric rating scale from randomization to 3, 5, 10, 15 and 20 minutes after treatment administration (using mixed-effect model repeated measure) and time to first pain relief (survival analysis). DISCUSSION: To the best of our knowledge, this is the first randomized trial of methoxyflurane vs active analgesic treatment to be carried out in Europe. The aim of the study is to evaluate the results in terms of efficacy and safety of methoxyflurane for the treatment of traumatic pain in Spanish emergency units (ambulances, emergency primary care and emergency departments settings), in order to assess the incorporation of this drug into the emergency traumatic pain SoC. TRIAL REGISTRATION: EudraCT: 2017‐000338‐70; ClinicalTrials.gov: NCT03256903. Despite advances in treatments for acute pain with new medications and development of widely accepted guidelines, inadequate assessment and management of acute pain still remain major problems in prehospital settings and emergency departments1. Reasons for the high incidence of trauma patients receiving inadequate pain treatment during prehospital emergency care include, the difficulty of patient care in the out-of-hospital area, the limited time available for such care, the great variability in the availability of analgesics and adjuvants between the various patient transfer units, and the existence of different action protocols. As a result, the patients present with poorly controlled pain at the time of arrival to the emergency department and even at the time of discharge from the hospital. If the patient requires fast pain relief for the treatment of traumatic pain, it is often necessary to resort to the administration of parenteral analgesics. This results in difficulties in the care of patients in the prehospital setting and consumption of both personnel and material resources in the emergency departments. In Spain there is not a well-established standard of analgesic treatment for emergency trauma pain or clinical guidelines with specific recommendations. The most used analgesics in the emergency departments are Non-Steroids Anti-Inflammatories Drugs (NSAIDs) and opioids administered parentally. Both of them are very good options, but NSAIDs are not very potent and there are safety concerns with opioids. Transmucosal administration of fentanyl is being using more and more, but it is only approved for the treatment of breakthrough pain in patients with cancer2. The increased use of transmucosal fentanyl in the emergency setting probably reveals the need for potent analgesics that can be administered quickly and comfortably from the perspective of both physicians and patients. An important addition to the management of pain in patients attending emergency units could be the availability of a drug: (1) with a noninvasive route of administration that does not require close patient monitoring (2) has a rapid onset of action that lasts for a reasonable period of time (3) is well-tolerated and (4) has sufficient analgesic potency across a wide range of pain types comparable with currently available analgesics. A drug of this kind could reduce the patient’s suffering between the patient’s arrival at emergency services and the administration of drugs after an assessment by doctors, mainly if it could be self-administered by the patient, using a light and portable device. Also, if patient cannulation could be avoided, the risks associated with this procedure under suboptimal conditions would be reduced. Finally, the achievement of more rapid pain relief, in addition to benefiting patients, could also facilitate an earlier review and treatment by physicians when the patient arrives at the hospital. Methoxyflurane belongs to the fluorinated hydrocarbon group of volatile anesthetics, and was first introduced as an inhalation anesthetic in the 1960s3. Among inhalational fluorinated anesthetics, methoxyflurane is unique in having well-documented analgesic properties at low doses4. Evidence has shown a large safety margin for analgesic use of methoxyflurane with a Penthrox® inhaler at the recommended dose of 6 mL/day5. Methoxyflurane has been used extensively in Australia and New Zealand, administered via the handheld Penthrox® inhaler6, and is indicated for the short-term pain relief in emergency medicine and in minor surgical procedures. The Penthrox® inhaler is a green, whistle-shaped single-use device that delivers methoxyflurane in analgesic doses7. Although the efficacy and safety of methoxyflurane via a Penthrox® inhaler has been evaluated in a clinical trial developed in emergency units8, it was compared only with placebo and only in hospital emergency rooms. 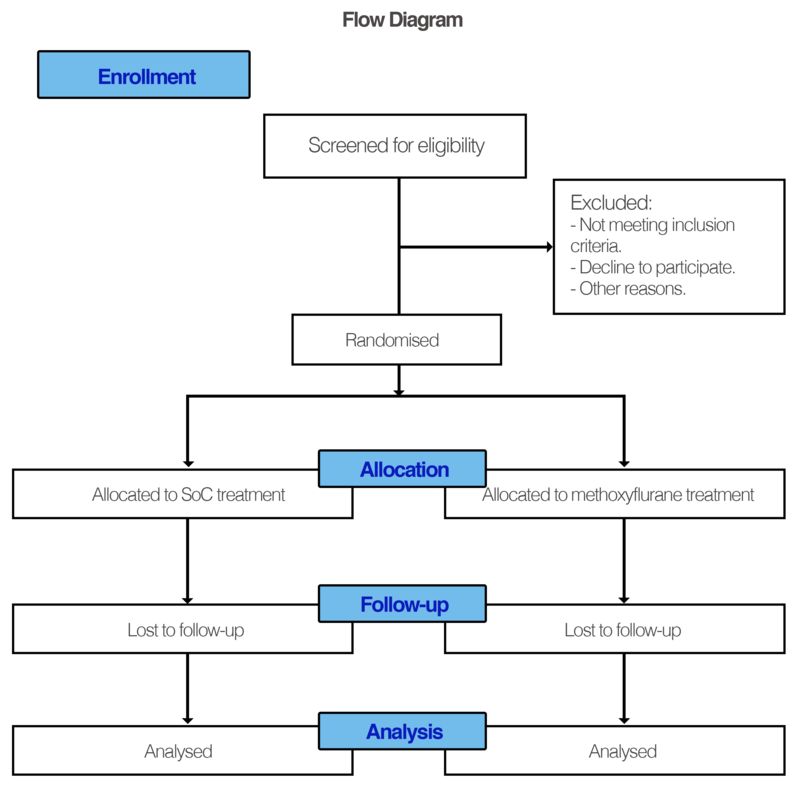 This is a randomized, open label trial with two parallel groups, aimed to assess the effectiveness, safety, health economics and patients reported outcomes after using methoxyflurane. Due to its administration advantages and its good efficacy and safety, the Pain Working Group of the Spanish Society of Emergency Medicine (SEMES) and the Spanish Clinical Research Network (SCReN) are interested in testing methoxyflurane against emergency analgesic standard of care (SoC) treatment in patients with moderate to severe pain associated with trauma who are treated in emergency units (hospital and pre-hospital emergency units), before incorporating this drug into their intervention protocols. InMEDIATE is an acronym (Inhaled methoxyflurane: Pain relief in adult trauma patients in Spain; in Spanish) of the study with code MR311-3502, EudraCT 2017-000338-70, and ClinicalTrials.gov identifier NCT03256903. It is a randomized, open label, multicenter trial with two parallel groups. The trial will be conducted at 15 sites in Spain (three of them pre-hospital emergency units). 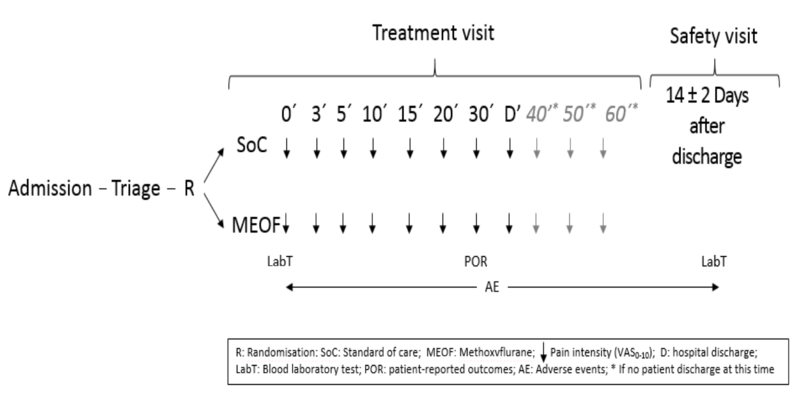 A total of 310 patients with moderate to severe pain secondary to trauma are expected to be randomized 1:1 to receive either methoxyflurane or SoC in the emergency units (Figure 1). Because there is not a well-recognized SoC in Spain, each principal investigator was required to report the SoC at their emergency Department for treating emergency moderate and severe pain due to trauma. All of the responses were submitted to the Health Authorities, before the approval of this trial. Change in mean pain intensity over 20 min: from baseline to 3, 5, 10, 15 and 20 minutes after the start of treatment administration (STA). Time from STA to the first pain relief. Analgesic effectiveness in patients with moderate pain (numeric rating scale [NRS] 0-10 ≥4 and ≤7), treated with first-step analgesics, assessed as the change between preadministration of the treatment and measures at 3, 5, 10, 15, 20 and 30 min after the start of the treatment. Safety in patients with severe pain (NRS 0-10 >7), treated with second or third-step analgesics, evaluated as the rate of adverse events that require treatment and/or increased duration of hospital stay. Speed of action of analgesia in all patients, assessed as time since patient randomization until the first meaningful pain relief, following patient’s criteria. Patient-averaged summed pain intensity difference 15 min after STA (SPID15), assessed as the cumulative sum of the recorded difference between pain intensity and baseline, at each time point to 15 min post dose. Pain Responders (with ≥30% pain relief compared to baseline) at 20 min. Determine the number of patients who reach a pain intensity NRS 0-10 ≤3 at 15 and 30 minutes after STA. Measure the change in pain intensity between the administration of the analgesic treatment and pain intensity at 40, 50 and 60 minutes in those patients remaining in the emergency units. Note the requirement for rescue medication during the 20 minutes after STA, and from them, to 60 min. Note the frequency of adverse events that occur from the 30 minutes after STA until discharge of the patients. Determine the level of satisfaction and the meeting of expectation with the treatment, rated by both patients and investigator. Evaluate the global clinical perception of the improvement, as assessed by the patients. Evaluate the pain relief cost per time unit. Determine the safety profile in each group of treatment. Patients eligible to be enrolled in this trial are adult patients (≥18 years old) with moderate to severe pain (NRS 0-10 ≥4), secondary to trauma, who do not require surgery or hospitalization longer than 12 h. Patients must be in an adequate level of consciousness and sign the informed consent. The following criteria exclude patients from participation: (1) Hypersensitivity to methoxyflurane or any fluorinated anesthetic; (2) malignant hyperthermia; (3) patients who have a history or show signs of liver damage after previous methoxyflurane or halogenated hydrocarbon anesthetic use; (4) clinically significant renal impairment (for the purposes of the study, patients receiving treatment for kidney disease or on dialysis will be considered to suffer from this degree of insufficiency); (5) pregnant or childbearing potential at time of inclusion; (6) clinically evident cardiovascular instability; (7) clinically evident respiratory depression; (8) patients taking any other analgesic for the acute traumatic pain before inclusion; (9) altered level of consciousness due to any cause; (10) degenerative diseases; (11) patients unable to understand the purpose of the study and perform self-assessments; and (12) patients who have participated in another clinical trial within 30 days prior to randomisation. Patients who meet all inclusion and none exclusion criteria, who have signed informed consent, will be randomized 1:1 through an envelope system. In one arm, patients will receive methoxyflurane, while in the other arm they will receive SoC treatment of the emergency unit. Patients will be randomized by doctors in ambulances and in hospital emergency units. The study visits and procedures will be performed as shown in Figure 2 and Table 1. 1The length of the administration of the analgesic trial treatment, as well as trial medication, will be recorded in the case report form (CRF). 2The first draw could be performed before or post-administration of the analgesic trial treatment. In both analyses, the following variables will be measured: alkaline phosphatase, Gamma-Glutamyl Transferase (GGT), Glutamate Pyruvate Transaminase (GPT); Glutamate Oxalacetate Transaminase (GOT); Blood Urea Nitrogen (BUN), calcium, chloride, creatinine, albumin, glucose, potassium, sodium, bilirubin, total protein, erythrocytes, leucocytes, hemoglobin, hematocrit, platelets, Mean Corpuscular Volume (MCV) and Mean Corpuscular Hemoglobin (MCH). 3In case of suspicion of a pregnancy, a pregnancy test will be performed from urine prior to analgesic trial treatment administration. If positive, the patient would not participate in the trial. Patients in the methoxyflurane arm will receive one inhaler containing 3 mL of methoxyflurane, through which they will be instructed to perform inhalations. Patients are also advised to exhale through inhaler so unmetabolised methoxyflurane can be absorbed by AC chamber. Patients will be instructed to initially perform some continuous inhalations, following by intermittent ones depending on their analgesic request. They will also be advised that they can close dilutor hole if they need stronger analgesia. In case the patient needs it, a second inhaler with 3 additional ml of methoxyflurane 99,9% will be dispensed (maximum daily dose: up to 6 ml [2 vials of 3 ml]). Patients could also require rescue medication, if needed. In the other arm, patients will be treated following the emergency units’ SoC for treating patients with similar clinical characteristics. Any kind of analgesic administered by any route will be valid. Only administration of one analgesic (or fixed combinations) at time 0 will be considered SoC. Other required analgesics will be considered rescue medication. Pain intensity will be measured at 0, 3, 5, 10, 15, 20 and 30 minutes after receiving medication, and at discharge time, using a NRS 0-10 scale. It will be also recorded time to first pain relief and time to first meaningful pain relief, following IMMPACT recommendations. If the patient is still at the hospital pain intensity will be also recorded at 40, 50 and 60 minutes after STA (Figure 1). Sedation rate will be evaluated at baseline and 30 minutes after STA, using Ramsay scale. Also measured will be patient satisfaction (using a NRS 0-10 scale), patient fulfillment of expectation (evaluated with the CEP scale) and patient global impression of change (PGIC) at 30 minutes after STA (evaluated using PGIC scale). Fourteen days (±2) after discharge, a safety visit will be performed at the hospital or by telephone. Laboratory samples for hematology will be collected at the start of the trial and at the safety visit (details of the evaluated parameters are included in table 1). During the entire trial, any adverse events will be recorded and reported to the sponsor and the health authorities (when applicable). Some 310 patients are expected to be recruited over 4 months. This number was calculated to meet the primary objectives of the study by attaching a significance level of 2.5% and a 90% confidence interval (Bonferroni method). The assumptions for the methoxyflurane group are based on data obtained in a pivotal study of this drug, assuming a difference of 20% with respect to the data expected in the comparator group, for both objectives. With these data, we would need to include a total of 295 patients. Assuming a 5% loss, a total of 310 included patients would be required for the trial. The analysis of the primary variable of efficacy will be made on an intention-to-treat (ITT) basis. It will include all the patients who are randomized, whether they have received the study treatment or not. In addition, the analysis of efficacy will also be performed in the “evaluable” or per protocol population (PP). This is a subgroup of the ITT population defined as those patients who meet the trial selection criteria, who have not received rescue medication and who comply with the protocol-defined monitoring scheme (at least baseline visit and after 3, 5, 10, 15 and 20 min complete). The safety analyses (intermediate and final) will be held in the safety population, which includes patients who receive at least one dose of the drug during the study. The statistical analysis will be performed by members of the SCReN. All patients who meet the selection criteria will be included in the analysis. Patients who are removed from the analysis, along with the reason they have been eliminated, will be detailed. No values will be allocated for unavailable data. The quantitative variables will be defined using the mean, median, standard deviation and confidence interval for the mean with a confidence level of 95%. The contrast of the distribution between dichotomous and categorical variables will be performed using contingency tables with the statistical chi-squared or Fisher’s exact test, as appropriate. The comparison of means between groups of qualitative variables, using Student’s t-test, will be performed when comparing two groups, and a single factor analysis of variance when comparing more than two groups, if the normality criteria are met. To evaluate the primary objective, an analysis of covariance will be performed, using a mixed model of repeated measures analysis of covariance will be carried out for 3, 5, 10, 15 and 20 minutes. Missing data major will not be imputed, and will be left as lost. In the analysis of repeated measures will be included fixed-effect terms for treatment and time random central effect and pain baseline value (0 minutes). Regarding other primary endpoint, time to first pain relief, a time to event analysis will be performed using time-to-event methodology, including a Cox Proportional Hazards model with treatment and qualifying pain intensity at randomisation as fixed effects and center as a random effect. Pre-dose pain baseline intensity (at 0 minutes) will be added as a covariate. Weibull assumption model will be checked and used when it holds. A Kaplan-Meier analysis will also be performed to evaluate the average time until first pain relief and first clinically meaningful pain relief. Cost of pain relief by time unit will be calculated as follows: Cost of treatment (drugs+fungible+nurse time..) = C; Pain relief (difference between baseline and time t) = PRt; known time= t. Then C / PRt [€ / cm] gives us costs (in euros) to reduce one cm of pain; And C / PRt / t [(€ / cm) / (min)] = [€ / cm min], is cost to reduce 1 cm of pain in one minute. All statistical analyses of secondary efficacy endpoints will be performed on the ITT and PP population and will be exploratory with no aim to draw confirmatory conclusions. All secondary efficacy endpoint data will be summarized descriptively by treatment group and time point (where applicable). All endpoints will be analyzed using appropriate statistical models, in order to get estimates (differences or ratios) and two-sided 95% confidence intervals for the treatment effects. All exploratory p-values will be from 2-sided tests and no adjustments for multiplicity will be performed. Subgroup analyses and sensitivity analyses, in particular with respect to different approaches for handling of missing data, will also be applied for specific endpoints. An interim analysis will be performed to assess treatment safety only, when 100 patients have completed the study. Coordination, management and monitoring of the study will be performed by the SCReN. The researchers will adhere strictly to the provisions of this protocol and will complete the case report forms. The study will be performed according to the recommendations for clinical studies and the evaluation of drugs in humans, as contained in the Declaration of Helsinki (revised in successive world assemblies) and in the current Spanish and European legislation on clinical studies and patient data confidentiality. The study will follow the principles of Good Clinical Practice. This study has been approved by the Clinical Research Ethics Committee of La Paz University Hospital (Madrid, Spain) and by the Spanish Agency of Medication and Health Products, and has been registered in Eudra CT (Eudra CT: 2017-000338-70) and clinicaltrial.gov (identifier NCT03256903). Methoxyflurane was initially developed as an inhalational anesthetic agent. It was later discovered that it had good analgesic properties at lower doses, with a good safety profile. It is currently used in countries including Australia, where it is routinely used in ambulance services because its low doses can achieve rapid analgesia, with easy administration. It has been recently launched in four European countries (UK, Ireland, Belgium and France), and approval is expected in the rest of Europe by the end of 2017, through a decentralized procedure. Despite the fact that methoxyflurane has been marketed in Australia and New Zealand for treating emergency pain due to trauma for more than 40 years, no randomised clinical trials to evaluate analgesic its effectiveness compared to active treatment have been published in this setting. Observational studies have shown that methoxyflurane has an analgesic effect superior to intramuscular tramadol, lower than strong opioids but faster than intranasal fentanyl, but none of them have been carried out in Europe. The only randomized trial to evaluate the change in pain intensity developed in Europe was a placebo controlled trial, and it was performed only in emergency hospital departments8. To the best of our knowledge, the described Spanish trial will be the first randomized clinical trial in Europe comparing methoxyflurane to active treatment, in the emergency treatment of trauma pain. In Spain there are no clinical guidelines for managing trauma pain. A large multicenter study carried out in 33 Spanish hospitals, including more than 1600 patients with acute minor trauma showed that less than 50% of the patients received analgesic treatment, and the most used painkillers were NSAID. During the last few years pain management in emergency setting has significantly improved with more opioids being used for treating severe pain, but we are far from achieving a standard of care, supported by strong scientific evidence. The present trial will help us to compare different analgesic protocols versus methoxyflurane used in both, hospital and pre-hospital Spanish setting. Methoxyflurane is the most used analgesic for treating patients with emergency pain in the prehospital setting in Australia17, and those Australian patients have a mean pain intensity above 8 (scored using a verbal numeric rating scale 0-10). We think that our trial will confirm methoxyflurane as a good option for being a first-line analgesic for treating acute pain in the Spanish emergency departments. The Scientific Committee of the study is made up of members of SEMES and SCReN. Mundipharma Pharmaceuticals S.L funds the study according to the guidelines of the current protocol. Mundipharma Pharmaceuticals S.L agrees not to interfere in the selection processes of the patients, analysis of the data and/or publication of the results, or any other process that might come into play with the results of the study. Funding will be independent of the results of the study. The Spanish Clinical Research Network (SCReN), PT12/0002, is funded by the PE of I+D+I 2013-2016 and by the Subdirección General de Evaluación y Fomento de la Investigación – Instituto de Salud Carlos III (ISCIII). It is also co-financed with funding from FEDER. ®PENTHROX is a registered trade mark of Medical Developments International Limited. Tomlin PJ. Methoxyflurane. Br J Anaesth.1965;37:706–9. Tomi K, Mashimo T, Tashiro C, Yagi M, Pak M, Nishimura S, Nishimura M, Yoshiya I. Alterations in pain threshold and psychomotor response associated with subanaesthetic concentrations of inhalation anaesthetics in humans. Br J Anaesth. 1993 Jun;70(6):684-6. Medical Developments International Pty.Ltd., 2009, PENTHROX® (methoxyflurane) Inhalation. Product information: Australia. Penthrox British Summary of Product Characteristics October 2015. http://www.mhra.gov.uk/home/groups/spcpil/documents/spcpil/con 1460695399101.pdf. Accessed 07 Aug 2016. Babl F, Barnett P, Palmer G, Oakley E, Davidson A. A pilot study of inhaled methoxyflurane for procedural analgesia in children. Paediatr Anaesth. 2007 Feb;17(2):148-53. Buntine P, Thom O, Babl F, Bailey M, Bernard S. Prehospital analgesia in adults using inhaled methoxyflurane. Emerg Med Australas. 2007 Dec;19(6):509-14. Gaskell AL, Jephcott CG, Smithells JR, Sleigh JW. Self-administered methoxyflurane for procedural analgesia: experience in a tertiary Australasian centre. Anaesthesia. 2016 Apr;71(4):417-23. Huang S, Pepdjonovic L, Konstantatos A, Frydenberg M, Grummet J. Penthrox alone versus Penthrox plus periprostatic infiltration of local analgesia for analgesia in transrectal ultrasound-guided prostate biopsy. ANZ J Surg. 2016 Mar;86(3):139-42. Johnston S, Wilkes GJ, Thompson JA, Ziman M, Brightwell R. Inhaled methoxyflurane and intranasal fentanyl for prehospital management of visceral pain in an Australian ambulance service. Emerg Med J. 2011 Jan;28(1):57-63. Konkayev AK, Baymagambetov SHA, Sainov MS, Bekmagambetova NV, Akhmetova AZH. Evaluation of clinical effectiveness of inhalatory analgesic “Penthrox” for pain relief in ankle injuries. Archives of the Balkan Medical Union 2013;48(S3):239-43. Lee C, Woo HH. Penthrox inhaler analgesia in transrectal ultrasound-guided prostate biopsy. ANZ J Surg. 2015 Jun;85(6):433-7. Nguyen NQ, Toscano L, Lawrence M, Moore J, Holloway RH, Bartholomeusz D, et al. Patient-controlled analgesia with inhaled methoxyflurane versus conventional endoscopist-provided sedation for colonoscopy: a randomized multicenter trial. Gastrointest Endosc. 2013 Dec;78(6):892-901. Oxer HF. Effects of Penthrox® (methoxyflurane) as an analgesic on cardiovascular and respiratory functions in the pre-hospital setting. Journal of Military and Veterans’ Health. 2016;24(2):14-20. Spruyt O, Westerman D, Milner A, Bressel M, Wein S. A randomised, double-blind, placebo-controlled study to assess the safety and efficacy of methoxyflurane for procedural pain of a bone marrow biopsy. BMJ Support Palliat Care. 2014 Dec;4(4):342-8.
Cooper SA, Desjardins PJ, Turk DC, Dworkin RH, Katz NP, Kehlet H, et al. Research design considerations for single-dose analgesic clinical trials in acute pain: IMMPACT recommendations. Pain. 2016 Feb;157(2):288-301. Ramsay MA, Savege TM, Simpson BR, Goodwin R. Controlled sedation with alphaxalone-alphadolone. Br Med J. 1974 Jun 22;2(5920):656-9. Pujiula-Maso J, Suñer-Soler R, Puigdemont-Guinart M, Grau-Martín A, .Bertrán-Noguer C, t al. [The satisfaction of hospitalized patients as an indicator of quality of care]. Enferm Clin 2006;16(1):19-26. Hurst H, Bolton J. Assessing the clinical significance of change scores recorded on subjective outcome measures. J Manipulative Physiol Ther. 2004 Jan;27(1):26-35. García-Castrillo L, Andrés-Gómez M, Rubini Puig S, Juárez-González E, Skaf Peters E, García-Cases C. [Pain in mild acute traumatic processes]. Emergencias 2006;18: 19-27.